Find your favorite new hair style – using your smartphone! 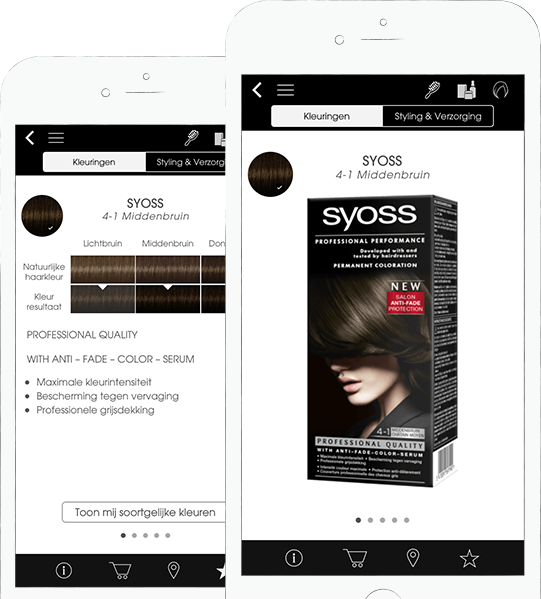 Released in 2016, the Syoss App is the dutch version of the international Schwarzkopf App. Using the Augmented Reality technology users were able to try out all included hair styles live via their camera view. On top of that all styles could have been found in a tutorial section and all products needed could have been bought directly within the app. First of the two most powerful features of the app: a big tutorial section guiding users step by step to all hair styles shown in the app. The tutorials were provided with images of each step in combination with small descriptions telling the user what to do. If users weren’t sure if any style shown in the app looks nice on them, the app gave them the great feature to try out all styles in a magic mirror, using the Augmented Reality technology. Furthermore, all styles could have been colored in any existing coloration of Syoss NL and, of course, users were able to take pictures of themselves and save them or share with friends. To shorten users’ way to their new dream style all products used for the different styles were included into the app and provided with the possibilities to directly order them via an online shop or locate a store nearby to buy them at. On top the three main features the app came up with a few more features, such as a favorite products section, a photo gallery, a FAQ section and an expert contact section to always give users the best service possible. 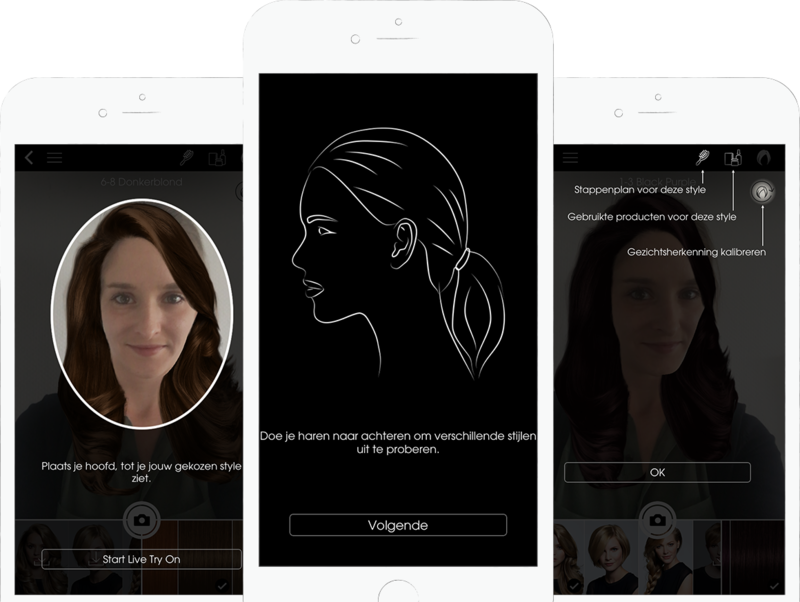 As I personally love the Netherlands I was really excited when I heard we would make an own version of the earlier Schwarzkopf App for them. 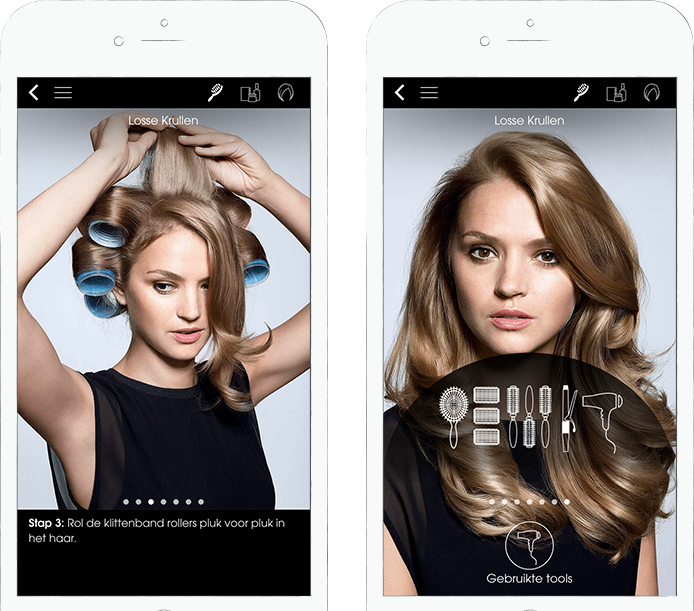 The app had exactly the same concept and design as the international Schwarzkopf version but with a darkened look again. 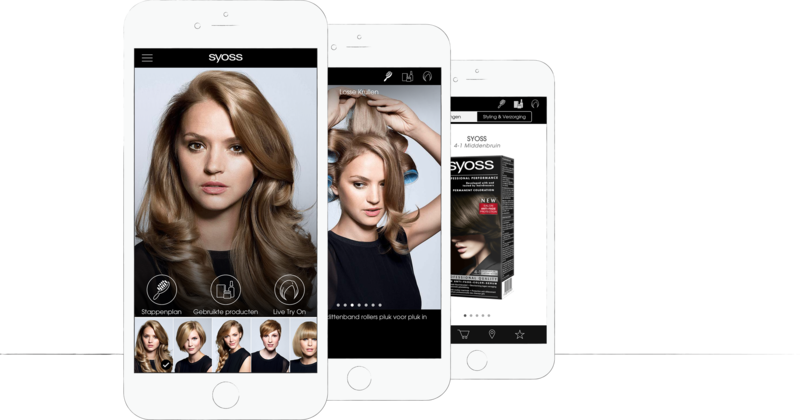 After having worked on the designs for the Schwarzkopf App for many months it was a warmly welcomed diversion to „invert“ the design and develop a new one adapting the CI of Syoss. After I had been working on this app family for several years this one was the last version I have been part of. And I’m extremely thankful, proud and happy that I’ve been part of the big team behind all those apps and that I’ve had the great opportunity to personally grow and learn a lot from creating them. You need some help with your next project or would just like to expand your business network? © 2018 Mandy Holz Design, All Rights Reserved.